Our deadline for ordering in time for December 24th delivery has now passed, but if you're still looking to give someone a gift we designed, you still have to make one yourself! Over the years we've put several of our projects and DIY projects on Thingiverse and Instructables to share for free for anyone to make. We've rounded up a few of our projects for you to make if you're still looking for that perfect gift. These projects will each take about a few hours to make, but no longer than an afternoon (with time for snack breaks of course!). For some of the projects, you will need access to a 3D printer, so see if you have access to one at your local library or maker space if you don't have one already! Use recycled paper and some wildflower seeds to make your own seed bombs. For this project you'll need access to a blender and optionally an ice cube tray to use as a mold. This project will take less than an hour to complete, but will need to dry overnight. One of our newest projects! 3D print one (or more) of these small succulent planters as a gift! The planters look great on their own, but they tesselate well to make a small desk garden! This project will take you about one hour each per planter to 3D print, with an additional 5-10 minutes for planting. Give some jewelry! Print one of these necklaces from files found on our thingiverse page, and create your own planter jewelry! Printing takes a little less than an hour, and another 5-10 minutes for planting. Finish your new necklace off with a leather or waxed cotton cord. Last year we published files for you to 3D print your own Little Little Free Library. 3D printing this takes about 2 hours, with about an additional 10 minutes for assembly. You'll need some super glue or hot glue to assemble this library together. Bonus points if you add some small 1:1 scale size dollhouse books! If you're looking for an activity or DIY project to make over the long weekend, we've been working on some small desk planters that you can 3D print at home! The planters measure 3" wide and deep by 3" tall, and they're perfect for holding small plants on your windowsill, or also useful as small desk organizers. Print out a few, and you can have a small botanical garden on your desk! You can find the files for free to download on Thingiverse. If you don't have access to a 3D printer, you may be able to access one at your local library, find a local printer at 3Dhubs.com, or use a printing service such as Shapeways.com. Today we wrote a new DIY guide for you! 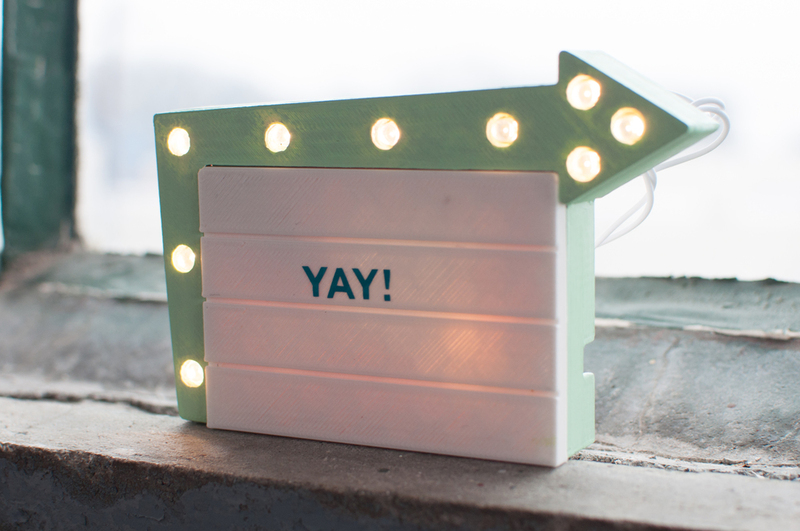 If you like marquee signs, and want to try an easy 3D printing project, we created a tutorial on Instructables for you to make your own 3D printed light-up marquee sign! This tutorial can easily adapt to your skill level with 3D printing and electronics. If you're a beginner, you can follow the directions to create the sign and learn some new skills. If you already know what you're doing, we show you the basics of this project and give you to improvise to make your sign more complex! To learn what to do, visit our how-to on Instructables. There are pictures accompanying each step to show you what to do. Planters prototyped in warm grey PLA hold rosemary from our roof garden. We've written before about prototyping with MakerBot and other home 3D printers over the last two years. For the planters that we sell here on our site and on Etsy, we prefer to use commercial 3D printers like Shapeways and Ponoko, but for prototyping, using a desktop 3D printer better suits our needs. Prints can be made in less than an hour (no waiting for a week for prints! ), and I can immediately make changes to file if I see a change that needs to be made. Printing on the Makerbot Z18. We've been lucky the last few weeks to have access to a MakerBot Z18, the newest of their series, to prototype some of our new forthcoming planters. Before we've printed on their Thing-o-matic and Replicator 2 Machines. The print quality has improved slightly from the earlier models, which is helpful when prototyping small pieces. The main changes with the newer MakerBots is the interface is much more intuitive to use, and now they're capable of printing much larger pieces. Also, these planters were printed in PLA, a plastic made from cornstarch. The material is biodegradable over time, but can warp when exposed to heat, making this material suitable for use for prototyping. Making and 3D printing on a MakerBot still isn't perfect, but its pretty amazing when you can hold a physical product in your hand that only existed on a computer screen hours before! Want to see more of what we're making? Follow us on instagram to see our latest projects and experiments.